This landmark would not to be a manifest of non-functional vanity heights materialized as a super tall tower but would rather be a large, extensive horizontal urban setting with a monument in front and multiple facilities with activities for the community and a big public square suitable for a fairly new capital to have for national gatherings inside. All this area would be surrounded by a tall fence which would perform as an environmental package sheltering the interior from unwanted extreme climatic conditions. 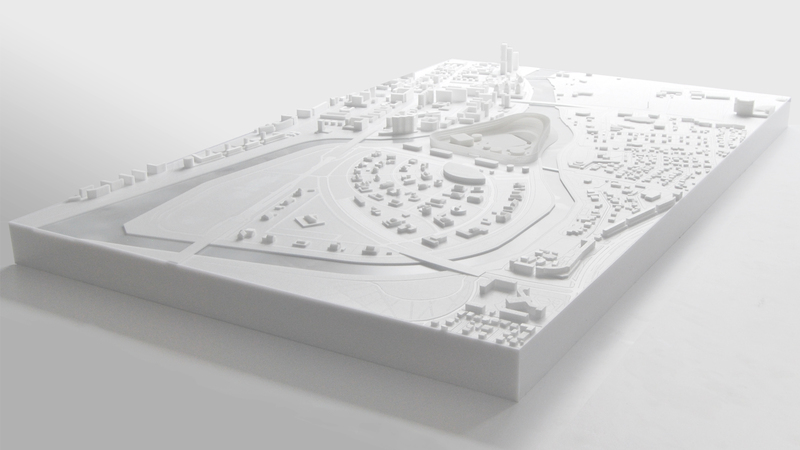 The desired iconic reception would still be achieved but by using local natural assets – the river surrounding the project area on the tip of the island located in the city center, would double with it’s reflective water the visual impact of the memorial during summer days. In winter however the water area would perform originally in an another manner. These views would be special in many ways as there is no other capital in the World which is more active during winter season when it’s river freezes entirely and becomes one of the biggest outside public spaces for outdoor activities even during cold temperatures. 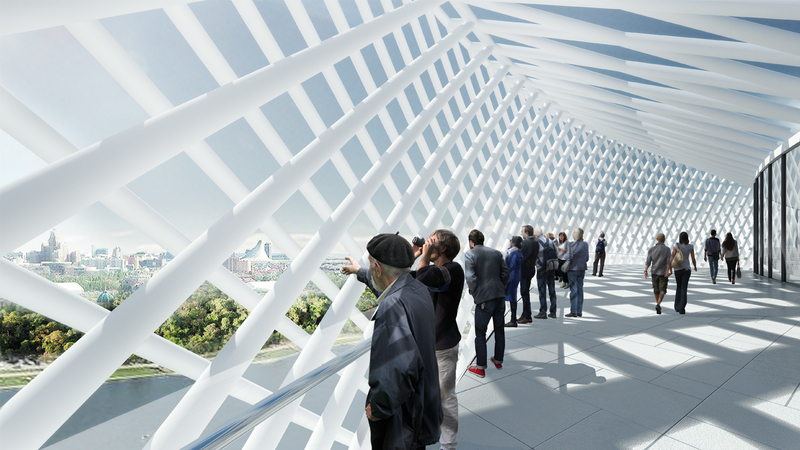 The Astana experience would be only enhanced by additionally creating a 1km long view route with a terrace above the monument from where all the most important city objects would be exposed. With social responsibility and sustainability in mind most of the materials used to build the entire complex would either come from local manufacturers or would be reclaimed and recycled. The architecture is not the main character of this story. The Kazakh landscape, people, the water of Astana – those are the heros. So the story is very simple as it is focused on the very location itself. The design of the memorial complex was influenced by the region’s exceptional natural phenomena like the Lake Kaindy’s Sunken Forrest which was naturally created by an earthquake ,the Charyn Canyon almost the size of it’s American counterpart but here covered with snow or the naturally carved in stone Ak-Mosque with a grotto height of 30m on a 254 m length. In combination with the unique culture and traditions of multinational people they would be the demonstration of the main wealth of Kazakhstan and would have the power to be the symbol of the country on a global scale. What is remarkable at first in the site in Astana are the climatic contrasts throughout the year that we decided to celebrate in our design. In the second coldest capital in the world we were looking at the city, landscape and river which are very unique as they have a very different performance through out the year. 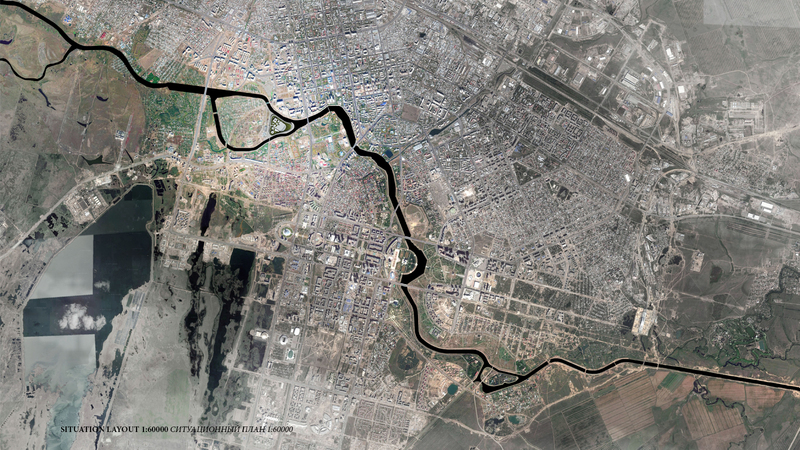 Unlike most cases in older cities where the first settlements where created close to the existing water areas here it was the opposite with the way Ishim river started to be used first only to be regulated afterwards. This generated special conditions with an active period on the water not in the warm summer season but during winters when the river transforms for almost half a year into a new public space performing like a long plaza where a range of activities take place in temperatures falling down to even -40 degrees celsius.This delivers views which are spectacular, unique and nowhere else in the World to be found then in this location-just like the Kazakh wonders of nature that were the starting point for the design of the Memorial in Astana. 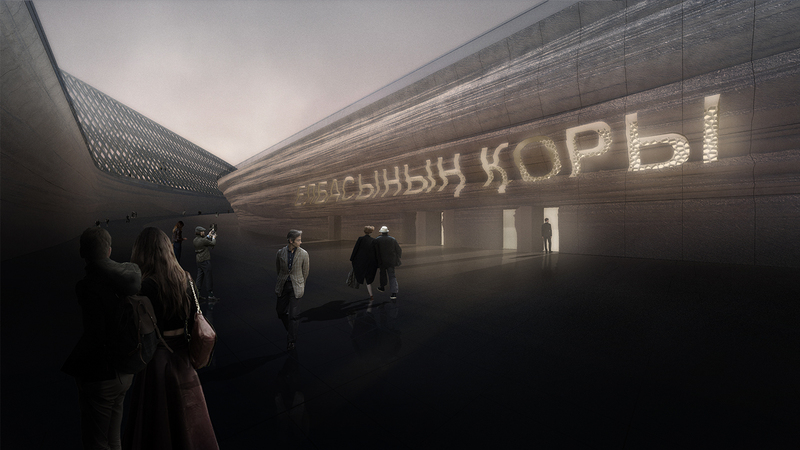 The project would be a way to remind Kazakh people of the exciting local natural richness ,bring the country closer to outsiders and to be perceived as a symbolic journey to the roots of the local culture. The natural environment with unique landscapes is often at the center of places of reflection, especially in the Kazakh tradition. They refer to the magnitude of nature which relates to our humanity. 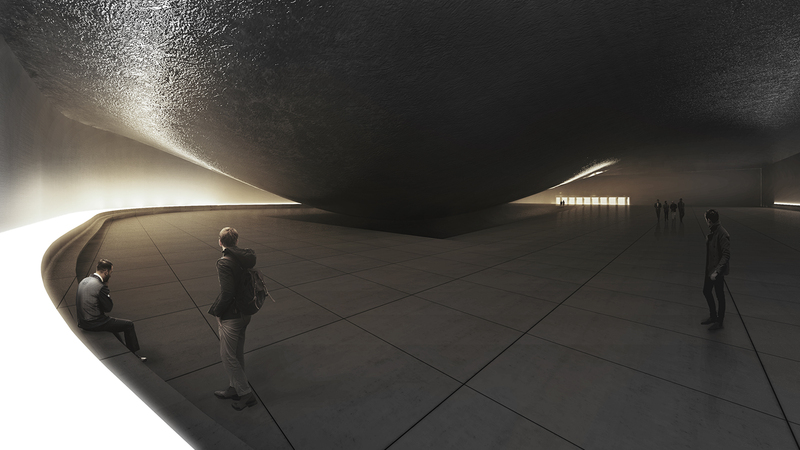 This special link would be materialized in the form of the core of our proposal for the entire monumental complex composition – the Memorial. 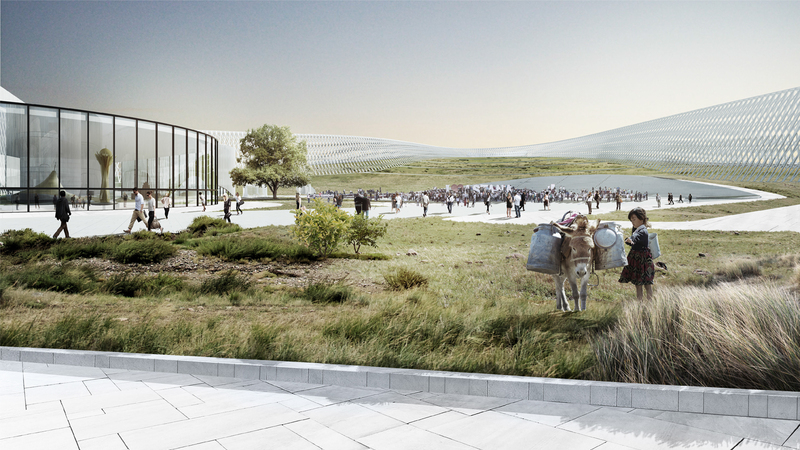 Positioned in the highly visually exposed Eastern side of the island and project location directly facing the Ishim river, it would open towards the vast empty river ambient creating a connection between the man accessible area and the surrounding natural environment. With a strong simple gesture based on creating a mirror clad lifted surface it would have a big visual impact attracting visitors already from a distance both from the city and the distant river areas. The intriguing and impressive in the environment form would compliment in a harmonic manner the natural heritage of the heart of Eurasia by referencing in it’s shape the tectonics of Charyn Canyon generated using the outlines of the map of Kazakhstan. When under the reflective 180m long dynamic undulated ceiling – one would feel the power of the country symbolizing the vast drive of it’s people for independence and undeniable success of it’s impressive fast development. This accessible walking area will be a silent place for contemplation and would bring to mind another wonder of nature located in Kazakhstan – the so called Sunken Forrest of Lake Kaindy. It would be referenced by a number of slim white poles that would evoke a distinctive atmosphere and at the same time embrace the brightest achievements of the nation which are resembled in the number of multiplied vertical elements. 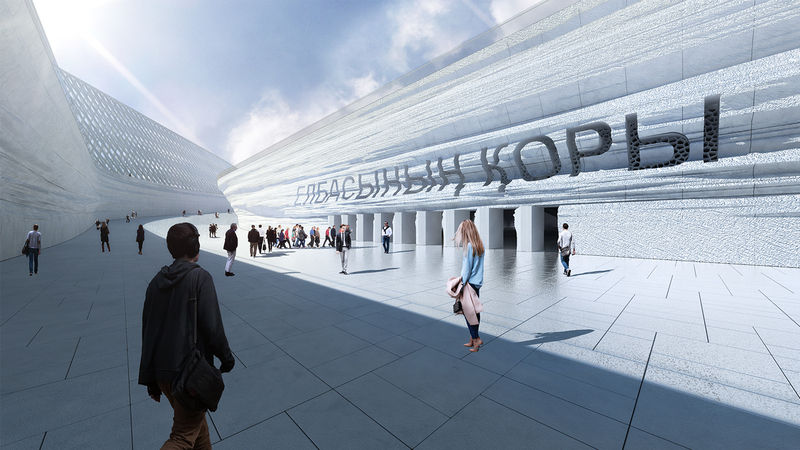 The entire area would be additionally outlined with the lifted ceiling surface’s edge which is shaped according to the map of Kazakhstan, elevated and declining to touch the ground so that each person visiting could identify himself or herself with the notion of inviolability of the borders of this country. Besides serving symbolical and decorative functions the Memorial would act like a gate, inviting visitors with a welcoming gesture of the extruded underside to be crossed directly from the ice frozen water during winter season or the boulevard in summer time. The trail would direct the guest with a sloping ramp leading downstairs to an underground level shaped like another landscape marvel- the cave of the Mosque Shakpak Ata where a commemorative space devoted to the spirit of the nation would be enclosed. From here the path would go up to reach the inside area of the grand complex. Nowadays blocks of granite or marble with engraved names and numbers are not enough to be exposed and acknowledged on a worldwide scale. What is necessary is a strong dramatic gesture to put the focus on the exceptional character of Kazakhstan which unfortunately remains still hidden. The Memorial complex however should not be just a symbol of past times like a grandiose statue but more like a modern monument fit for the XXI century which would additionally enrich and animate the society. Imagined as an architecture that can be both a beautiful sculptural artwork and serve the citizens and guests showcasing the most special enjoyment of Astana as a live accessible ensemble. Being a point of interest not only of visitors but as well residents of the capital city on a daily basis. A place that lives and that you visit more then once as common monuments. The identity of the design is deeply rooted in the origin of nomadic lifestyle and the main assumptions of tengristic beliefs. From the majestic nature, it’s relation with people and historical heritage, to the 10 year-long development of Astana. 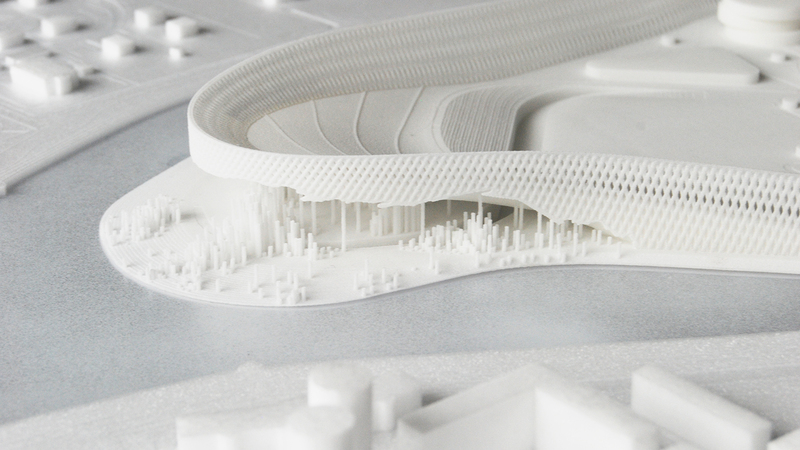 The Memorial complex will not be a radical superposition of new foreign imported elements but an enhancement and holistic showcase of the qualities that are already present in the landscape of Kazakhstan. 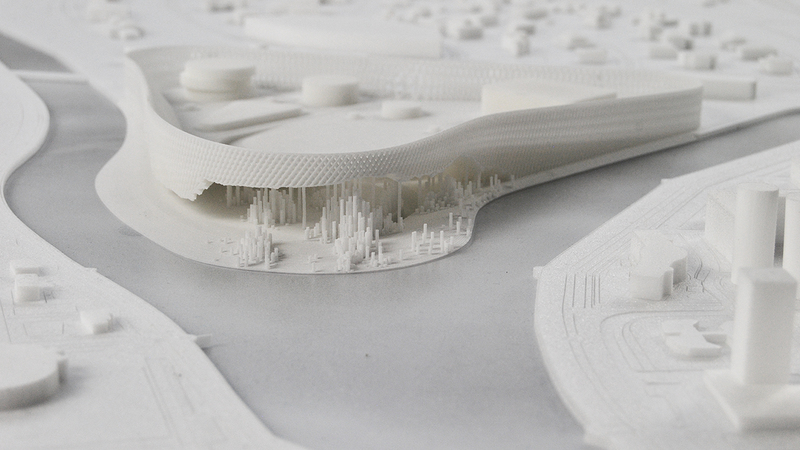 Rather than imposing a new identity on the complex the design proposes to grow it out of the context, with an architecture that as a result offers a fresh take on an ancient wisdom revisiting the classic elements of nomadic settlements. A project of special significance, distinctive ideologically, historically and culturally tied to the traditions of it’s people. With the main aim of taking the Astana experience and condensing it into an interesting form with unique solutions that are both functional ,experimental and at the same time rational and artistic. The combination of the monumental front with the human centered design of the areas inside the complex would create a strong partnership and define the architectural quality of the proposal. The project raises it beyond an established architectural style where it’s external form is neither modern high-tech or classicist but a combination of performance and commemoration that relates with the context. It is a result of a study on the city’s landscape and Kazakhstan’s natural context in order to create a design that fits in well with the ambient and does not repeat itself anywhere else on a local and worldwide scale. present in one of the most common elements of the local landscape – the steppe whose original spatial qualities and free space in open areas are found more impressive and normal for the Kazakh mindset then the type of congestion present in many other cities in the World. The site would be therefore used to the maximum functional limits to cover it with a visible very spatial design which is large but not forcing too much to stand out with vanity heights, thus adding important value to Astana and Kazakhstan, just like the Eiffel tower in Paris in France or Jefferson Memorial in Washington, USA which are modest icons that don’t scream for attention. Internally it would be a statement for Kazakh citizens of the strength of the main ideas of sovereign statehood which everyone creates and is part of. 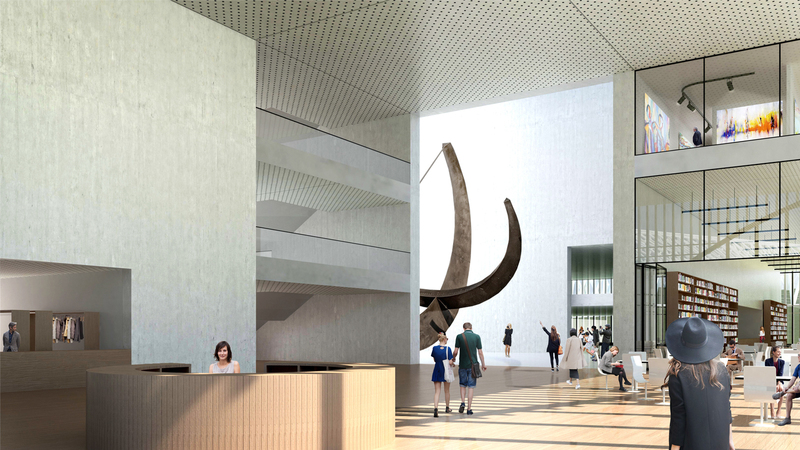 The external character of the architecture of the Memorial Complex would be both familiar, fresh and being firmly rooted in the heritage yet evolving into the future. 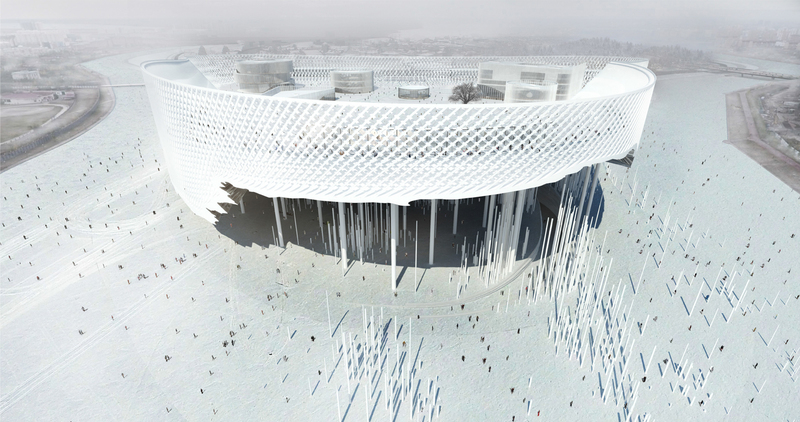 It’s proposal after an extensive research and experimentation period would take the form of a perimeter snow fence which resembles a scaled structure of a yurt acting as a unifying element across the large footprint. Inside the widely accessible area visitors would be framed by a tall mesh which would bring a sense of comfort by protecting them from unwanted climatic conditions – like strong prevailing winds in both summer and winter. The porous character of the 30m tall envelope made from reclaimed and recycled industrial steel would guarantee it is not a solid bulky wall or barrier for people but a smart environmentally protective design which can be crossed anywhere, encompassing as well walking galleries from within. 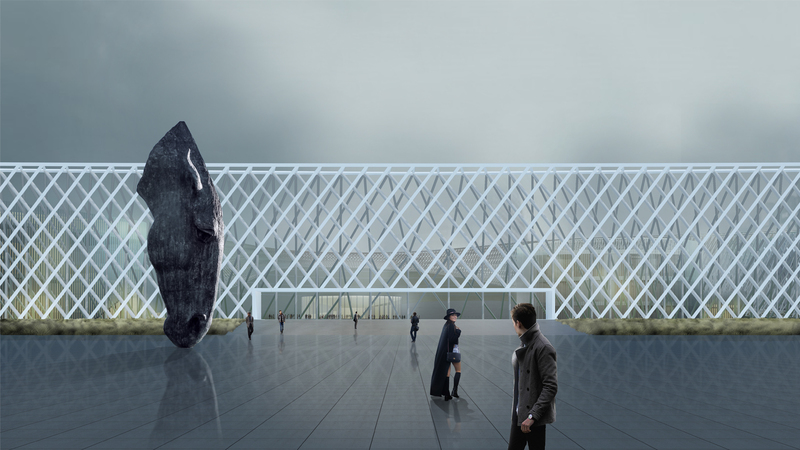 The see-through facade would animate the surrounding areas, with transparency revealing activity in the internal areas relating well with the external surrounding ambient of buildings. It would change it’s appearance throughout the year becoming more solid and white in winter time with icing and snow blizzards passing through and during the day depending on the angle, intensity and color of the light that would be pouring on it. 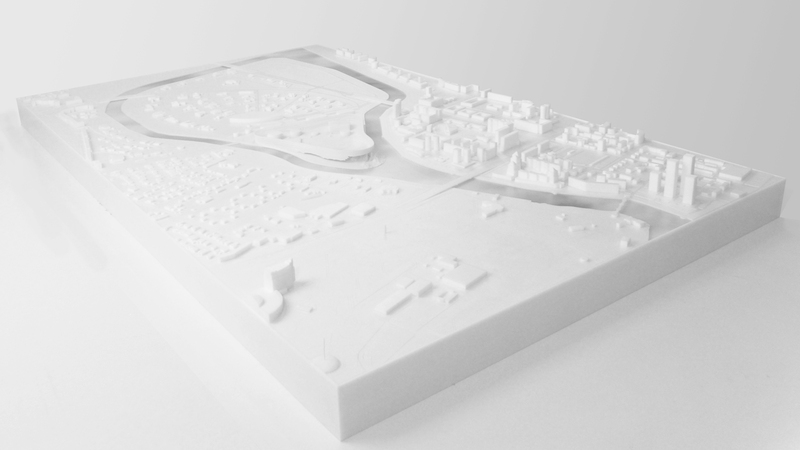 The concept of our proposal is based on the understanding that the memorial complex should not try to shock by offering a vanity height but instead interest the spectator by embracing the locals traditions and giving the people a place for belonging and to which they can relate to. Offering a diverse program for a diverse society as a central gathering place for city residents of all ages and a must-see destination for foreigners. 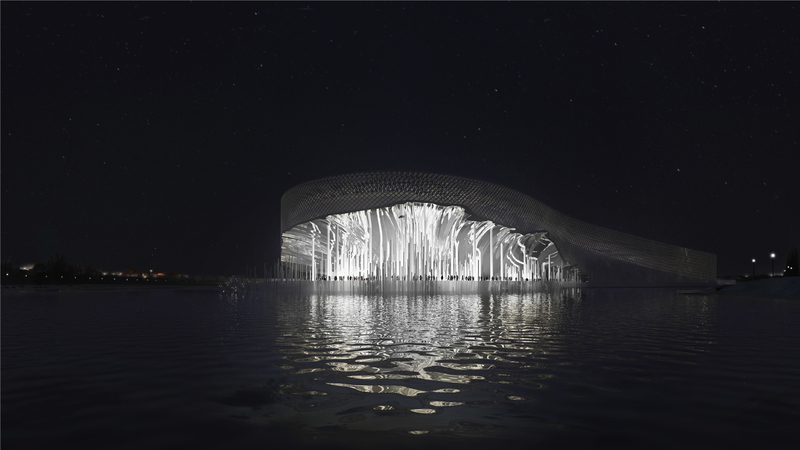 Its waterfront location would act as a welcome center for visitors and a year-round focus on culture and leisure for inhabitants. Inside the complex a 14,2 ha public area would be flanked by a plaza with a tribune and buildings with public program. They would be accessible from corner entrances in direct view contact referencing the settling scheme of yurts where the openings where oriented towards important areas. The design of these complex facilities is intended to reference traditional Kazakh vernacular buildings – the structure used in yurts would be reinvented to create the facades of circular solids and forms with filleted corners which emphasize the movement around them. All buildings would have a consistent facade design scheme with an intelligent glass skin wrapped with wooden fins to precisely diffuse or limit sunlight when needed. The big site would allow to situate with comfort and important buffer zones a range of programmatic distribution such as: the Museum of Modern Kazakh and International Art (MOMA Astana) where not only Kazakh art would be exhibited from the facility already present in the city but also the work of internationally renown sculptors and painters which would perform as an attractor for outside visitors; the Community Center with a library, childcare and activities for citizens; the Tengrist Center commemorating the nature with important elements present in the design such as the sky, water and land; the Arts & Crafts Center where one could learn about Kazakh traditions , the City Info Center about Astana for visitors where it’s iconic building symbols would be exhibited around the internal space in the form of tall physical models, The Gastronomic Center with restaurants, bars and cafes with an outdoor sitting deck for leisure activities. After careful analysis of functions such as of a national museum or mosque they proved to be already present in a close distance from the area and serving the inhabitants efficiently enough to be abandoned in the process of building the program for the complex. The design would also be adaptable with added space for grow, intended to work as a flexible framework able to accept change both during design development and its life as an operational facility. Before that takes place temporary white pavilions with sheltered seating areas would occupy it. 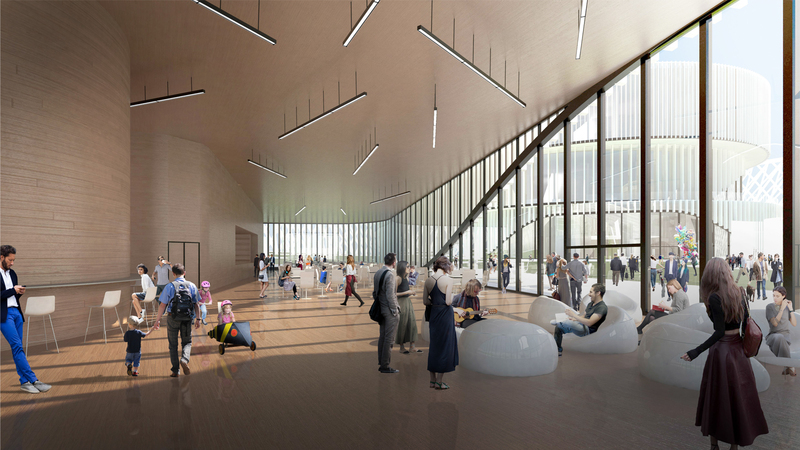 The remaining plot area would be devoted to creating a spacious foyer outside the fenced area with commercial ground floor service buildings outside the Memorial Complex. The core part and starting point in the design of the whole complex composition was a unique place for gatherings. Unlike any other big spatial square in the city throughout all the year it would offer a new pleasant micro-climate inside with many public functions and attractors bringing the feeling of citizens’ safety, high economic potential and society’s well-being that provides a base for civic events. This would be achieved by surrounding the entire 14,ha area with an environmental barrier that would limit the amount of strong winds during the winter season and would promote the use of natural ventilation to cool down the area during summer days. At the same time this fence would provide a free access for every resident and visitor of Astana with varying entrance directions depending on the climatic season and only during special circumstances the entire area would be easily enclosed with control checkpoints on the inside of the fence. 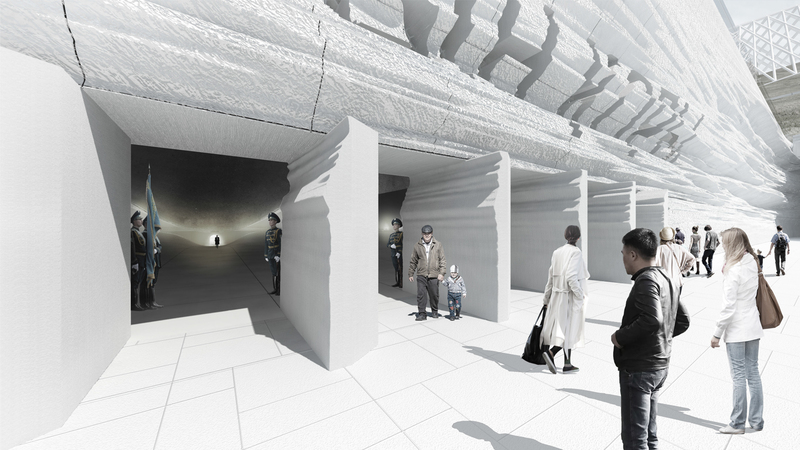 A seamless continuity between the external environment and the space inside the complex would be created when one would cross from the memorial through a corridor which passes by a commemorative space leading to the big public assembly. 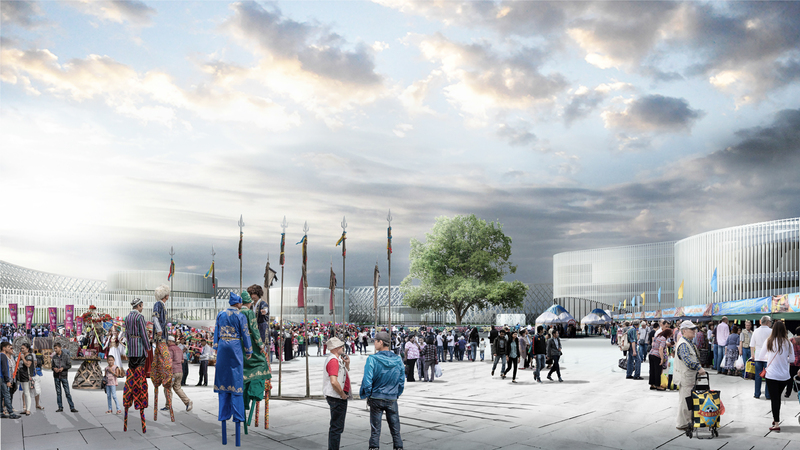 This sheltered arena with a 27 000 sqm plaza and an adjacent large tribune could host up to 200 000 guests being at the same time easily divided with a flexible operational zoning scheme for evacuation and security. 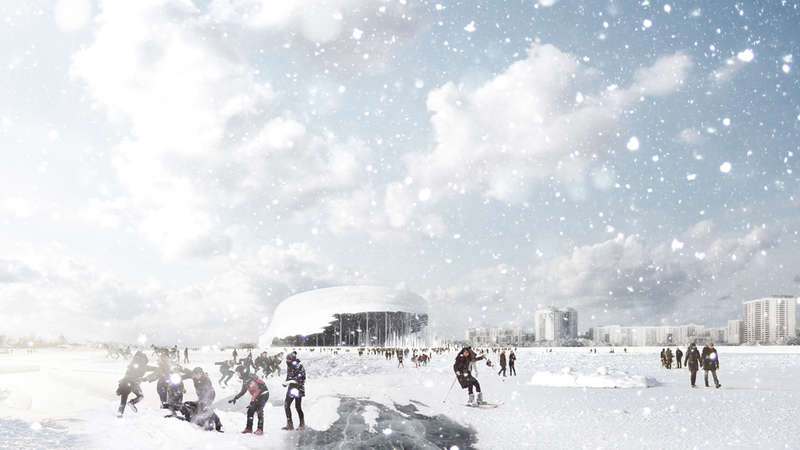 The flat surface of the square would have the potential to be adapted to various functions like big national events, popular concerts ,exhibitions, market places during summer or for example ice rings on winter. Holding the name of the Nursultan Nazarbayev Square together with the Leader of the Nation commemorative space positioned underneath it would be the heart of the Memorial in Astana which figuratively translates the message of the brightest achievements of the country and celebrates the life and achievements of the First President. Similar to the character of nomadic life we want to propose to the visitors an enriching experience related to the movement on the site. 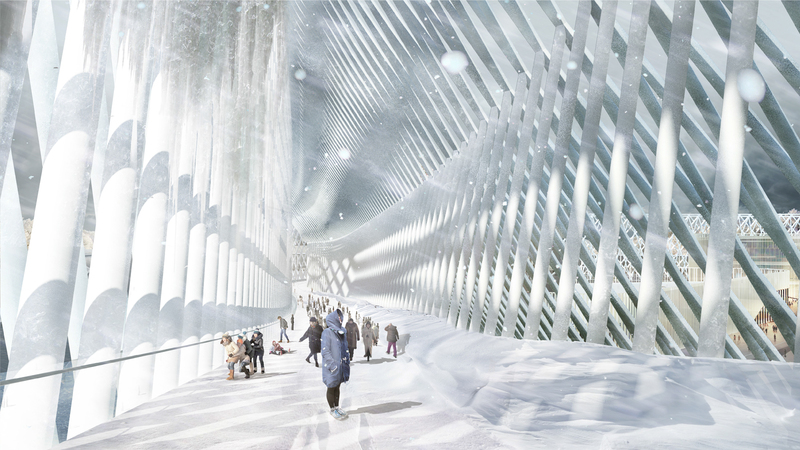 The snow-fence facade around the entire 34,600sqm area would have a 6m wide walking pedestrian path in the middle. It would gradually rise on the eastern side of the location on a 500m distance to create the experience of taking people on a 1km journey along the facade to showcase on the way the man-made wonders of Astana through our architecture. 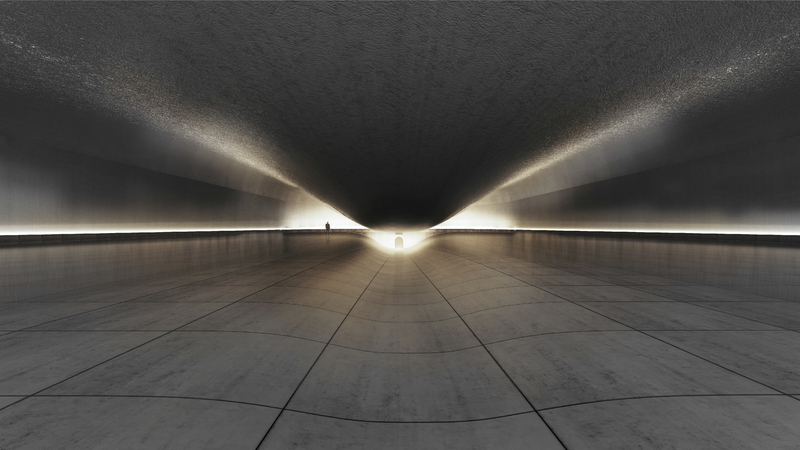 The project would commemorate all previous important architectural efforts by referencing them it’s form. From the view terrace on the top it would offer panoramic views of the entire city with all mega projects of the Head of the States and their successful progress imparting the First President and the Leader of Nation Nursultan Nazarbayev. 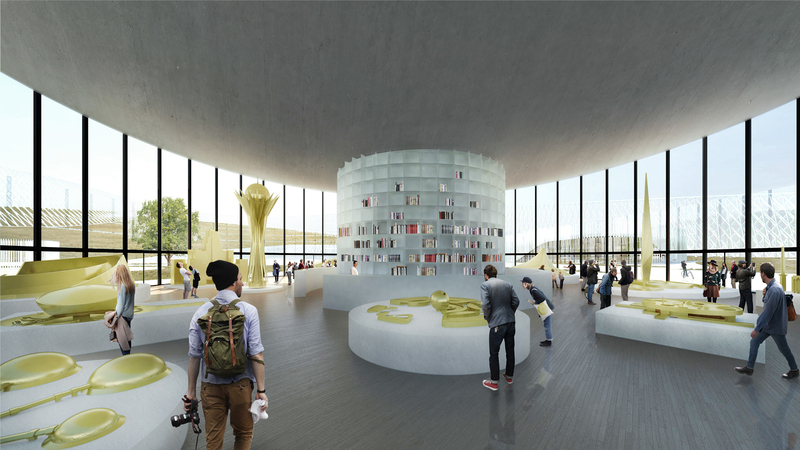 A way to relate with his legacy would be available as well in the Astana Info Center where all the landmarks would be visually exposed as big scaled physical models bringing a sense of continuity of the experience of the enjoyment of seeing them live after the or before the visit. The landscape design of the large garden surfaces in between buildings would reference steppes as the most natural environment for vast areas in Kazakhstan. Paths made of white stone would be meandering here through green areas covered by small low-water and drought resistant vegetation like moss,grass and grouped tall grass. 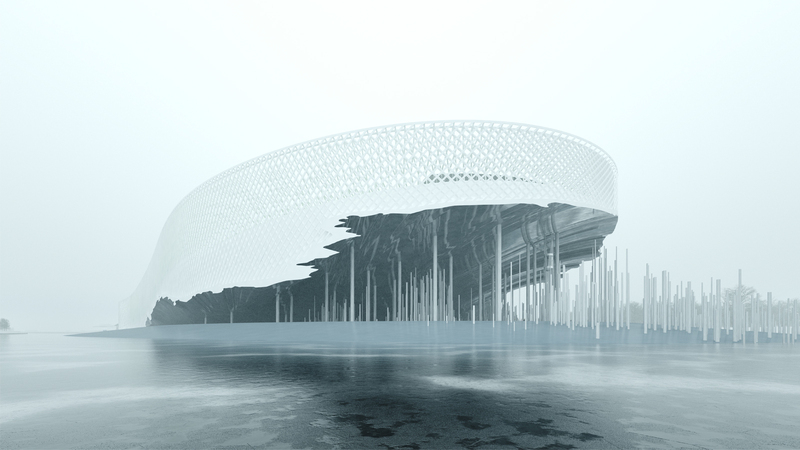 Circling around buildings they would create dynamic public spaces and a surrounding active ground floor plan like in typical nomadic settlements which promote movement. In the center of the composition a special poplar tree would be planted resembling an important symbol in Kazakh tradition – The Tree of Life. It would be like a pin which marks a special place located underneath. The main entrance to this setting would be framed and centrally oriented. It would perform like an orientation point helping visitors to find intuitively the main direction of circulation for bigger groups. 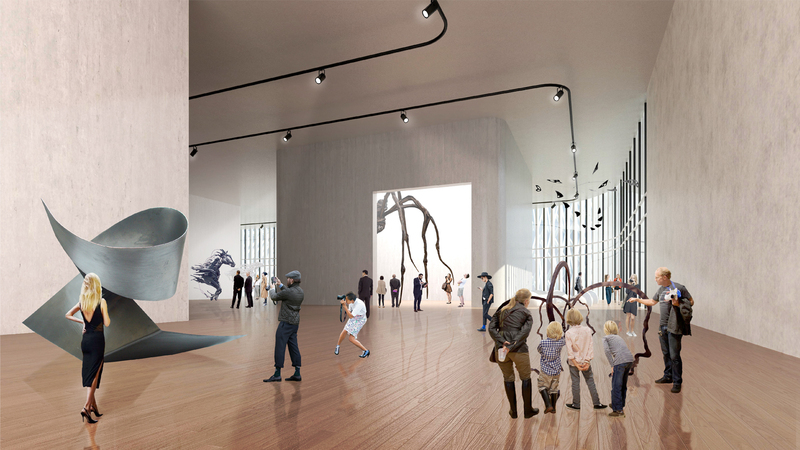 At the heart of the arrival, a new landmark would rise in the form of a 20m tall bronze sculpture being an artistic interpretation of the popular in the Kazakh tradition and culture motive -the domesticated horse. No use of water would be planned inside the complex due to problematic issues related to isolation that might occur. 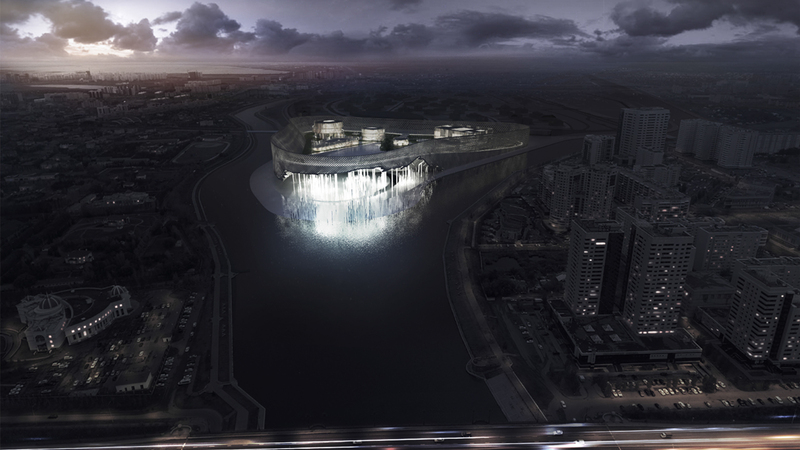 The water surrounding the site would enough to animate it during winter. During summer however an existing close-by SPA center would offer a range of water activities. 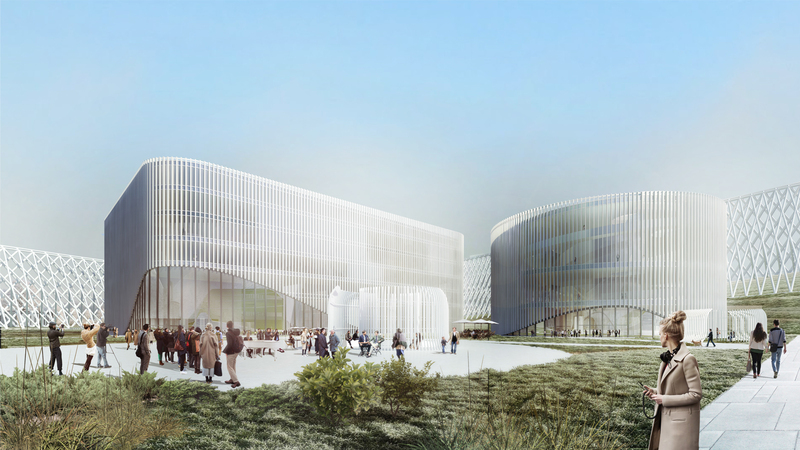 The project is not only about the looks – it is a modern environmental design focused on performance and resiliency which would be a recognizable example of how to erect future mega facilities not only locally but internationally. Positioned at the heart of the steppe with the air temperature range of over 40°C in the summer and minus 40°C in the winter, Astana is typical of an continental climate with big contrasts. 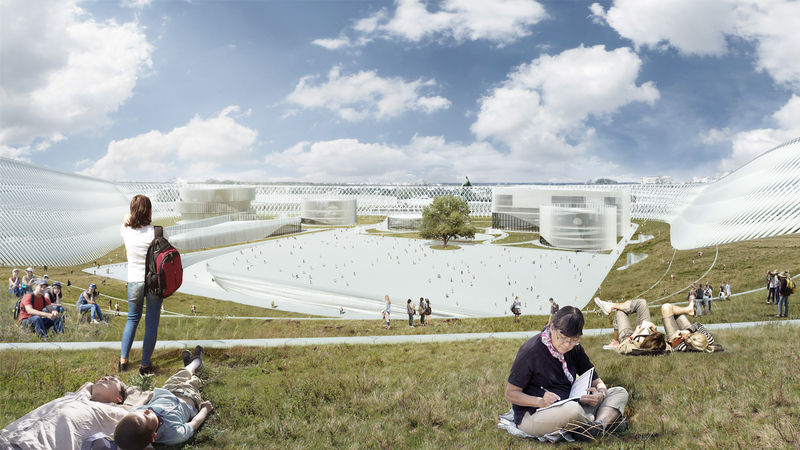 The Memorial Complex design would be optimized towards the control of those extremes. In a low-tech way it would guarantee an improvement of conditions of an entire 36ha new district with an envelope performing like an efficient machine. 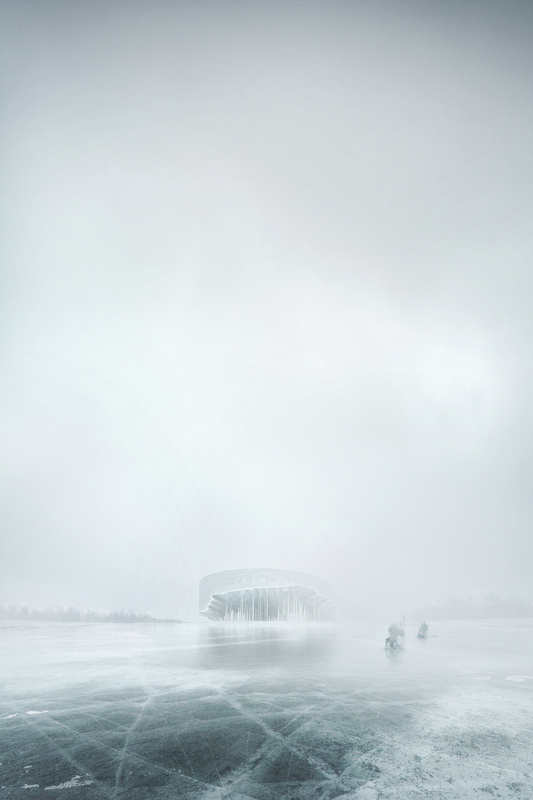 The main inspiration for the perimeter fence facade of the Memorial Complex was the rigid concept of the resistant structure of a traditional yurt and snow fences which frequently appear in cold places around the world. After adjusting it to our site by scaling their elements for pedestrian circulation purposes we achieved a two layer structure that would control snow blizzards and drifts during winter days. It would not be a wall as air would still pass through it’s porous structure which is essential to naturally ventilate the area. The major winds would be forced to go around and through the fence loosing speed and energy. Suspended snow particles would drop out as wind speeds decrease forming drifts in front of and behind the fence or would get attached to it what could improve in the process it’s insulation in a natural way. In result very little snow would reach the inside of the complex keeping walking paths open and increasing internal visibility. 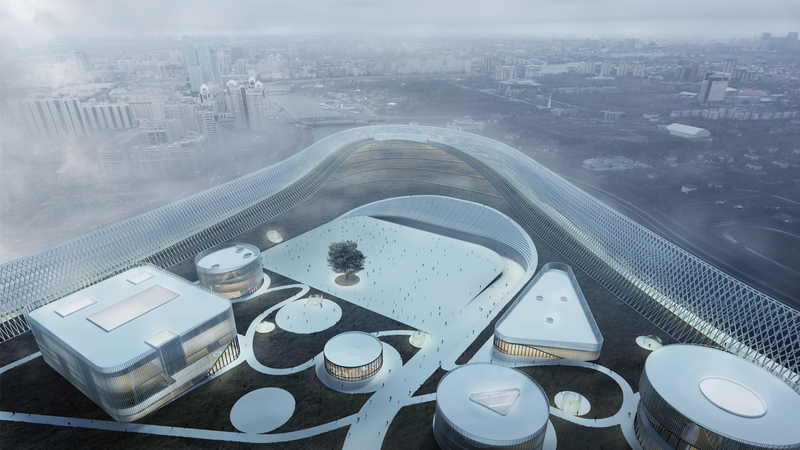 In the Memorial Complex area the building’s design composition, geographical orientation and visual identity would be based on local environmental analysis and data. 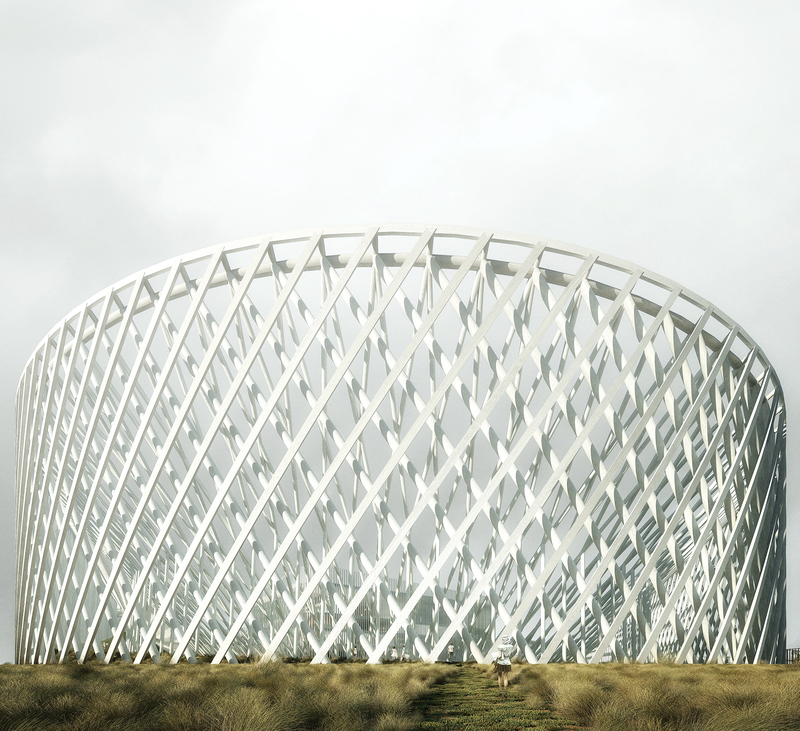 Generated with climatic parameters as a group of functional solids they would have open facades to make the most of low winter sun and would be covered with shading vertical fins to avoid overheating during summer days. 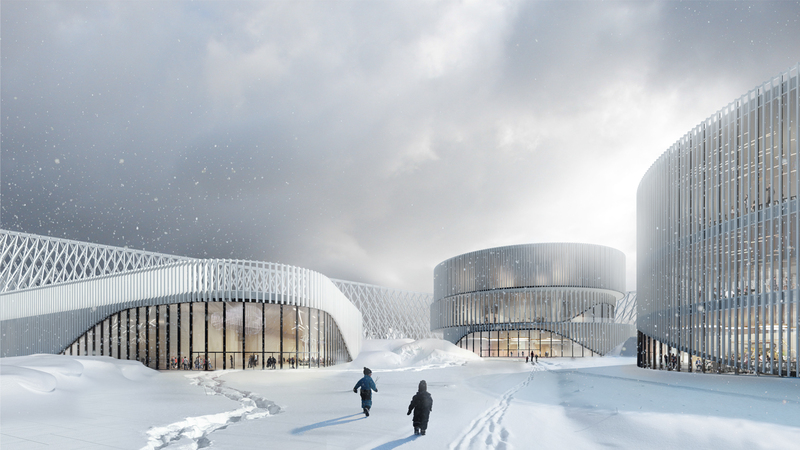 Their roofs as would be as well inclined to minimize additional heavy snow weight with the potential for extensive use of photovoltaic cells on top of them. With the 2017 Expo taking place in Astana closely related to the green economy concept and devoted to gathering energy by using solar and wind power there is another burning issue which needs to be addressed related to an another important natural resource – a water shortage by 2030. In our proposal this would be seriously addressed by using the maximum of the immense plot area to create the biggest reservoir in the country that could act as a water supply system and be a showcase for all Astana future developments. To achieve that all the area would have a 2m slope with a minimum inclination directed towards the inside of the plot to control and direct the run-off rainwater straight to the retention tanks in the underground level right underneath the city square.To improve harvesting of water from snow the lifted eastern side of the complex would have heating cables installed under a permeable green moss surface with collecting gutters. The close proximity of the water surrounding the tip of the island would be on the other hand also considered as an asset during summer season – the buiding interiors would be cooled down by using a river water circulation scheme what would result in savings in air-conditioning costs. It is a paradox but the possible incoming water crisis related to it’s shortage does not necessary mean that it’s current excess in an another place will not be an issue. The Yessil/Ishim River which surrounds the project site located on an island delivers not only positive features but may be considered a danger for the investment. Our project proposal’s aim is to minimize and eliminate them in a few ways. From the outside the flooding of the area during spring time due to the rise of river water levels would be avoided by elevating the boulevard by 2m and creating a perimeter barrier around our plot. High groundwater levels could on the other hand poise a threat from the inside causing soil liquification. 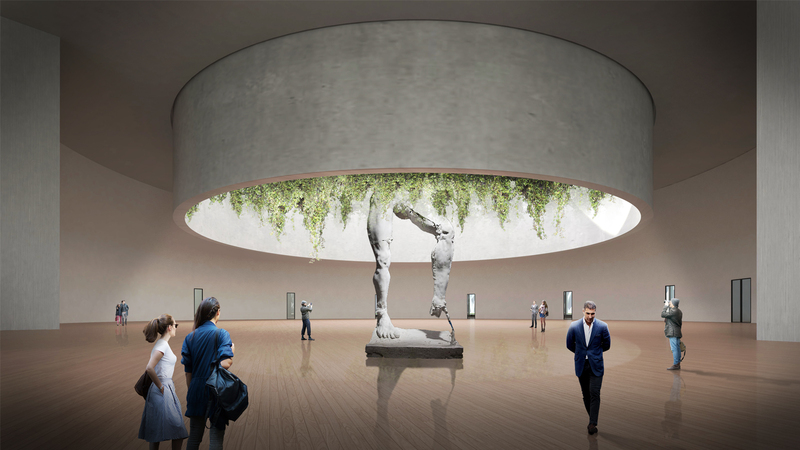 To avoid that we proposed minimizing the amount of excavations and the only necessary underground areas such as the vault, art storage, technical rooms and the commemorative space would be surrounded by a retaining basin with 1,5m thick concrete wall reinforced with steel elements. The structure of the complex buildings positioned on the ground would be based on transfer slabs which supported by min 10m tall piling. The facade of the tall fence would be at the same time it’s own structure resisting to additional forces like winds and snow blizzards. 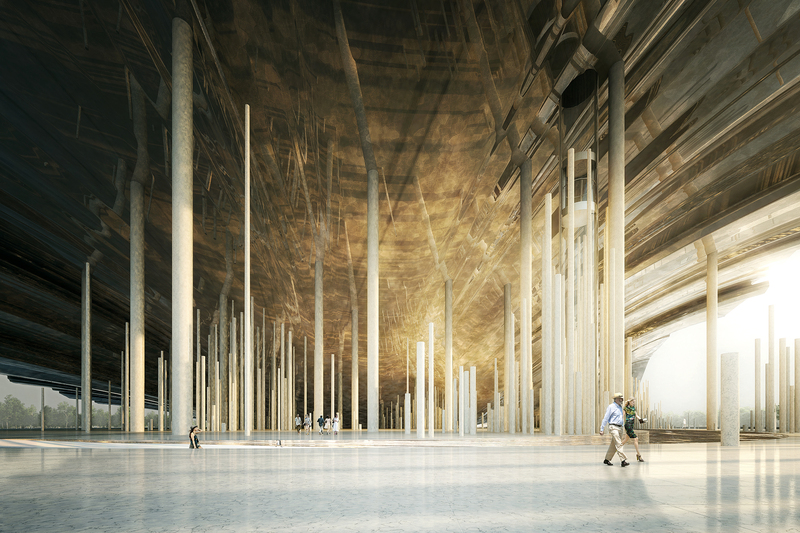 The lifted internal surface and Memorial roof would be supported by 1m thick steel columns. Vertical elements in it’s front touching the surface and entering the water would additionally stabilize the liquification of soil and hold it together. The materials with their specific color and temperature have been vital in this narrative design. The special status and nobility of the Memorial will be emphasized with its high quality finishing chosen materials. The 180m long impressive surface of the underside ceiling which was supposed to drag attention was clad with high quality stainless steel would provide together with a group of steel white painted steel masts and a floor made of white Italian Carrara marble exceptional mirrored views of the Memorial which would merge with reflections of the surroundings. Natural light would only enhance them when it would pour down on to the water, ice or snow depending on the time of the year giving everything a different effect and reflected would bounce on various surfaces reaching the end of the deep area. The perimeter fence surrounding the 26ha complex site on the other hand would not be aostentatious manifest of vanity but a proof of the drive for a sustainable future by using on a massive scale materials more friendly to the environment like recycled industrial steel which there is an excess of in the country. The exterior of the buildings would be made mostly of glazing which regulates together with vertical fins made of birch-trees overheating and for the internal areas certified oak would be chosen as the dominating timber material for both floors, walls and ceilings as it is easily formed, stable and tactile. The plaza, tribunes, boulevard and the memorial floor would be covered with white Italian La Facciata marble which retains its brilliance and crystal white color even when wet with all necessary technical quality in terms of stability, density, and longevity as well. The project proposal would value the importance of public spaces and accessibility in the area. The Memorial Complex would be opened from every side and available from the external paved walking surface surrounded by small bushes where various fence openings allow to always enter the complex. 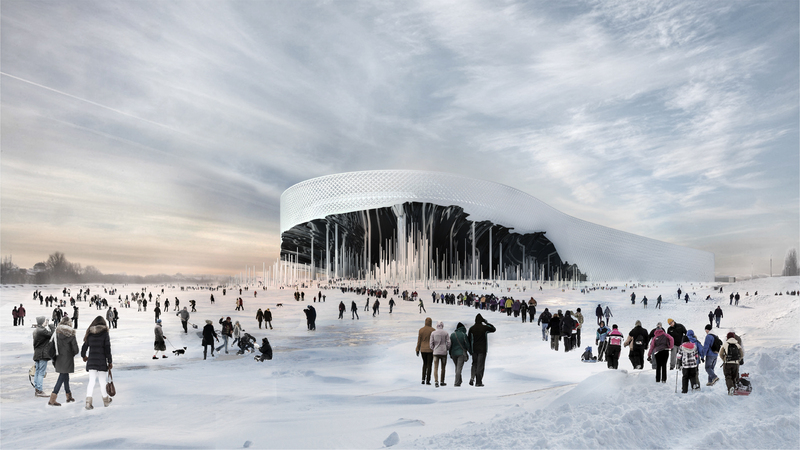 By improving the conditions and comfort in the ambient of the Memorial Complex the proposal would promote walking in the project area as well during the winter season when due to the strong cold winds with snow people normally prefer to use the cars. To improve this kind of movement a pedestrian bridge would be created on the South side to connect the island’s boulevard directly with the city. Instead of establishing additional bridge connections from the East which could obstruct the view of the Memorial the Memorial would be offseted from the border of the site to create a gentle slope for direct winter access to the site and complex from the walking area on the river. All other inclinations of surfaces have been adjusted to people needs. 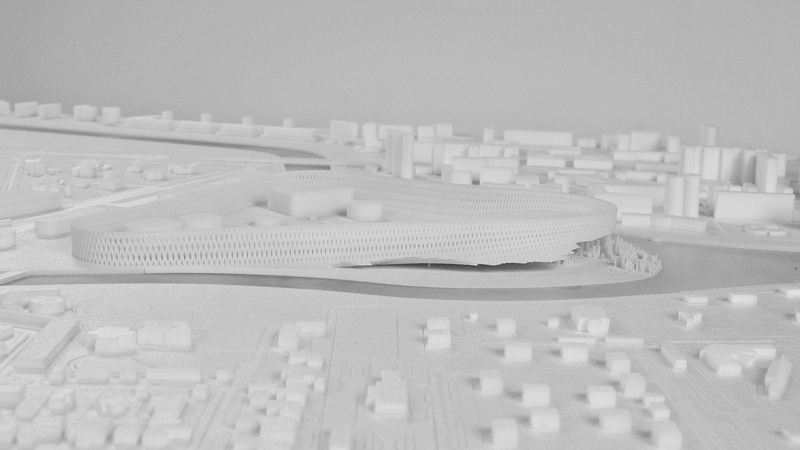 The longest trail of 1km would which would be a raised promenade would have on top in the middle area an elevator enclosed with glass which could be reached from downstairs in the Memorial level from the boulevard or from the underground connection with the Complex. Ascending from the public ‘inlet’ to the top floor with the view terrace and promenade it offer visitors glimpsed views out over the entire city and it’ icons. Another highly praised way to commute would be biking with separate paths for cycling arriving on newly planned car and pedestrian bridges connected to the Western entrance zone where a big bike parking an city bike’s rental base would be located. 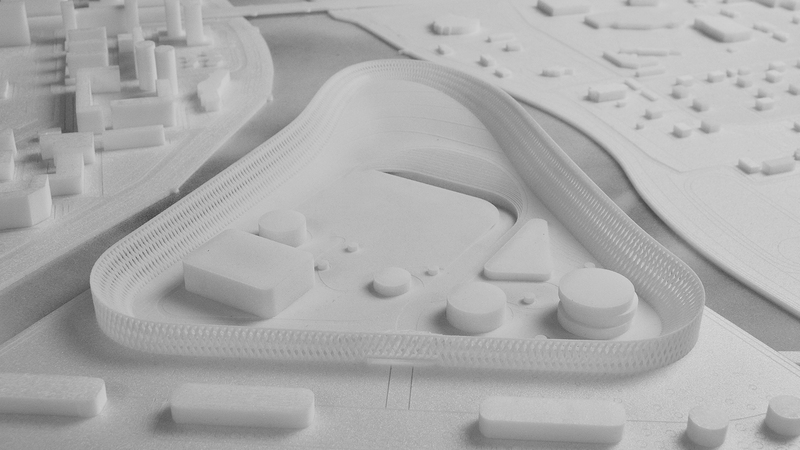 The main car and taxi access to the complex would take place from the adjacent street together with an entrance for deliveries leading under the snow fence along a ramp to the basement level with storage, vault and technical facilities. Car parking lots have been calculated to handle not only cars but also buses in case of a large event. 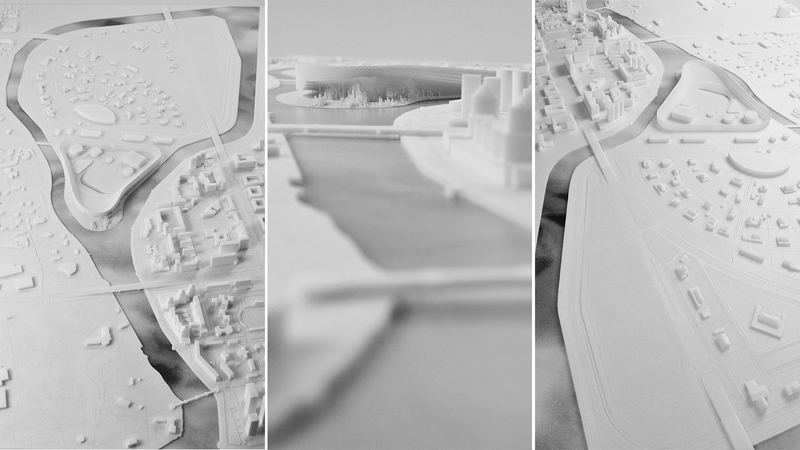 The project proposal design creates strong visual and physical connections with the Ishim River and the city beyond. The feeling would be enhanced by the reflections of the raised ceiling of the cave-like Memorial area making it clearly visible as a dominant project from all angles and sides on the land with abundant views from the flowing river. Even though it’s inclined form would merge with the city skyline without trying to compete for vanity heights it would stand out the same time being noticeable in the cityscape because of it’s large width and length and the additional double height thanks to the reflection on the water or ice of the lifted front during summer or winter days. 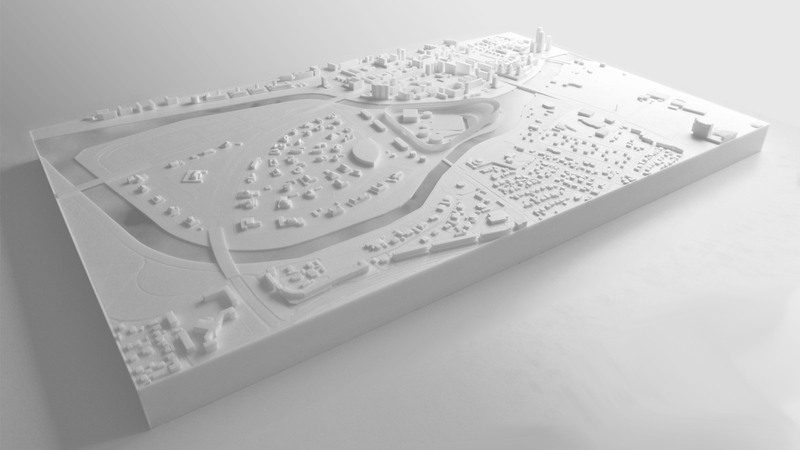 Architectural-planning and compositional solution proposals of the Memorial Complex Project are well integrated into the nearby existing and newly planned areas of Astana according to the urban master plan. 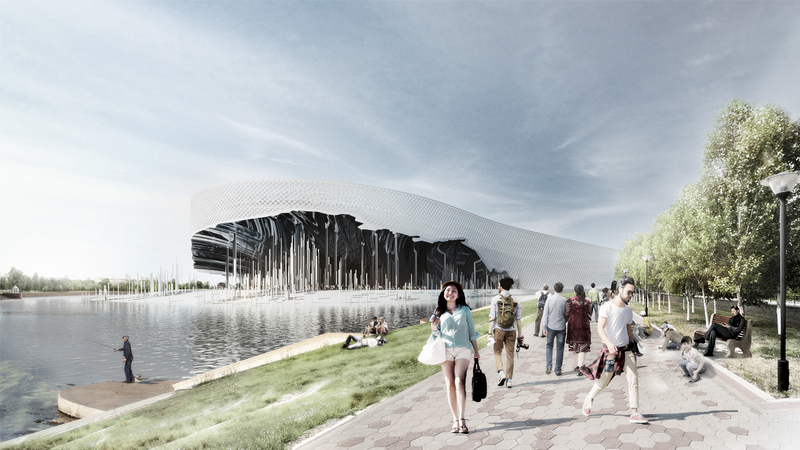 The project would play an important role in the urban development plan of Astana where radical changes are currently taking place in the city center and soon will take place on the newly designed island area forming part of large-scale plan to create a new cultural, residential and leisure complex in the city. Over the last couple of years Astana became one of the most vibrant places in Central Asia ,an important business spot and modern and remarkable city for the visitors. Our intention was not only to design a facility to support Astana’s transition into a global destination and hub but a future-facing emblem for the city’s evolution. 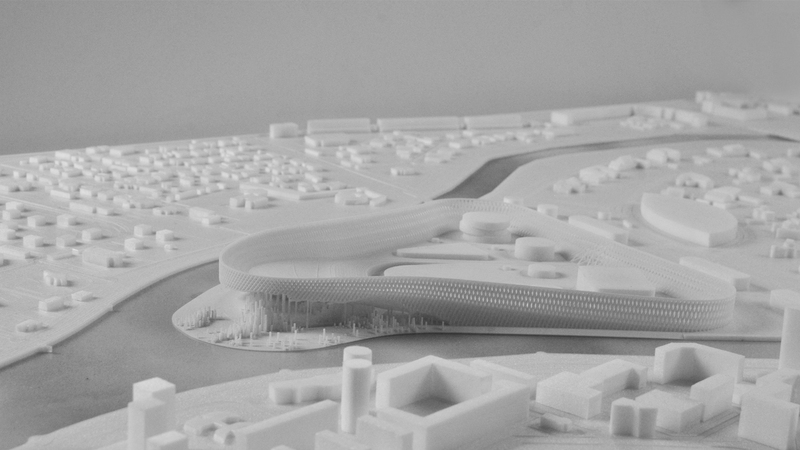 As a young new place with intense rapid urbanization it is a perfect place for the experimentation and implementation of the most challenging and brilliant new performative approaches just as the presented project proposal.